Bruno Mars – Melbourne March 11th 2018 – Concert Review - SY Music - Music Lessons. Consulting. Music Production. 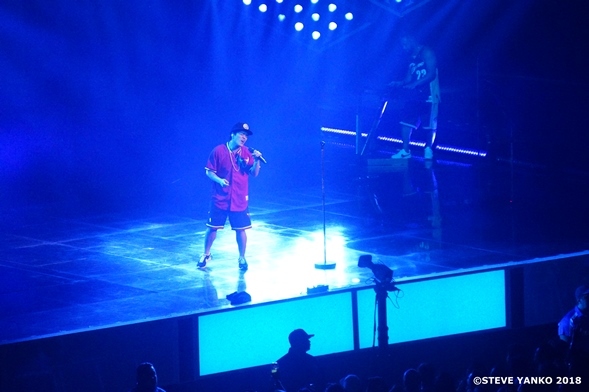 A few years ago I saw Bruno Mars in concert and was very impressed (see review). Last night I attended his concert in Melbourne and as expected he put on a brilliant show. Bruno Mars is a fantastic songwriter, musician, producer and entertainer. By combining all of these skills in concert last night he re-affirmed why he is loved and respected by his fans. 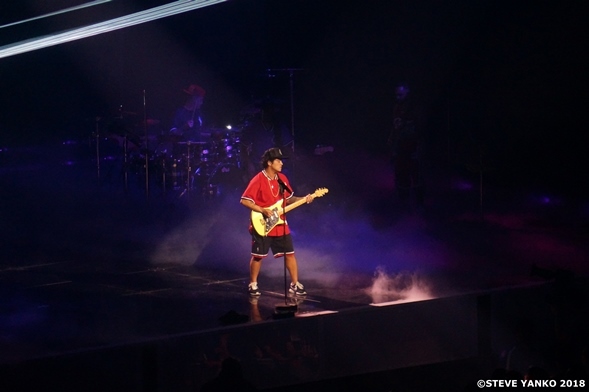 Bruno Mars on his 24K Magic World Tour in Melbourne. Bruno Mars with some of his band members. The staging for the show was sparse. There were no guitar amplifiers on stage which meant the band members could move around the stage freely. It also meant that there were a lot of dynamic changes made to the stage throughout the show. The lighting effects were spectacular and the changing platforms on stage were one of the best I’ve seen in concert. Bruno Mars on his dynamic stage. 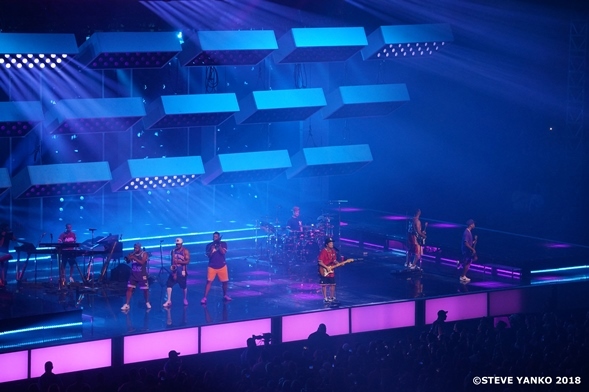 Bruno Mars was backed by an impeccable group of talent musicians that comprised of guitar, bass guitar, keyboards, drums and a 3 piece horn section. To top it off, most of the band members also sang backing vocals. Bruno Mars playing guitar in the song ‘Calling All My Lovelies’. 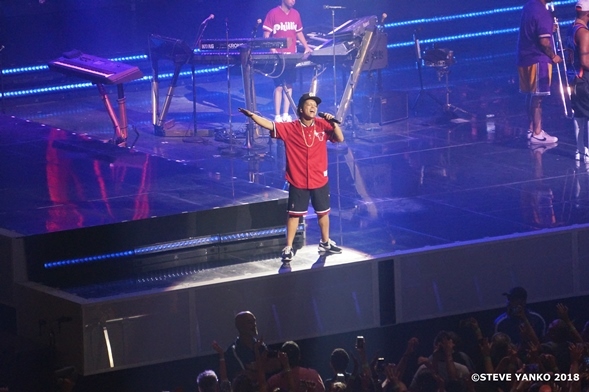 From the moment Bruno Mars was on stage he walked around with a confident swagger. He knows what he’s doing and he knew he was going to give his audience a fantastic show. His voice sounded strong throughout the show and this was clearly evident when he sang the beautiful ballad “When I Was Your Man”. Bruno Mars singing ‘When I Was Your Man’. Furthermore, Bruno Mars’ dancing was amazing. Throughout the show Bruno Mars and his band danced brilliantly to choreographed moves that seemed to be inspired by James Brown and the dance styles of hip hop and soul music. Every time Bruno Mars thrust his hips, the ladies screamed. Personally, I was impressed by how the guitarist and bass guitarist moved effortlessly to what appeared to be complicated dance moves to me. 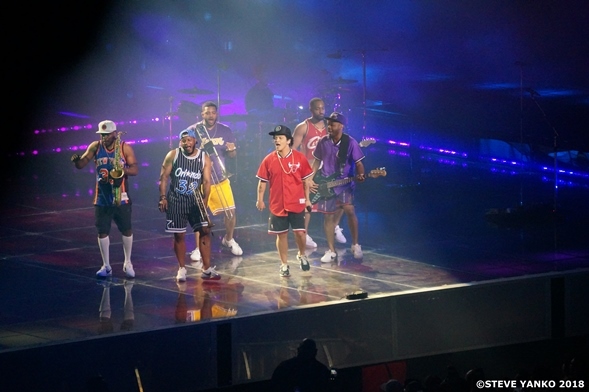 Bruno Mars with his band. 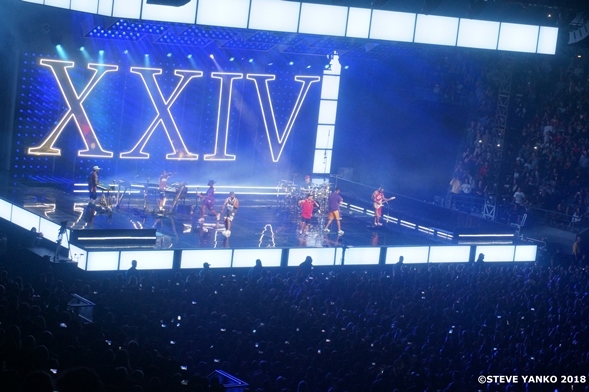 The set list for the show mainly contained the up-tempo songs from Bruno Mars’ Grammy Album of the Year “24k Magic”. There were also hits from his previous albums such as “Treasure”, “Locked Out of Heaven”, and “Just The Way You Are”. A highlight for me was hearing one of the guitar riffs from Prince’s song “Purple Rain” incorporated in to “Marry You”. Not many ballads were played last night but this only gave the concert a great party vibe and made it a fun show to watch. Bruno Mars performing ‘Marry You’. Overall you could not fault this show. It was a bright and energetic show with awesome music performed by extraordinary musicians. It’s a testament to Bruno Mars that his songs have connected with so many people worldwide. At last night’s show there were people of all ages and races enjoying the music and performance of one pop music’s brightest stars. As I left the arena, I could see so many happy people. 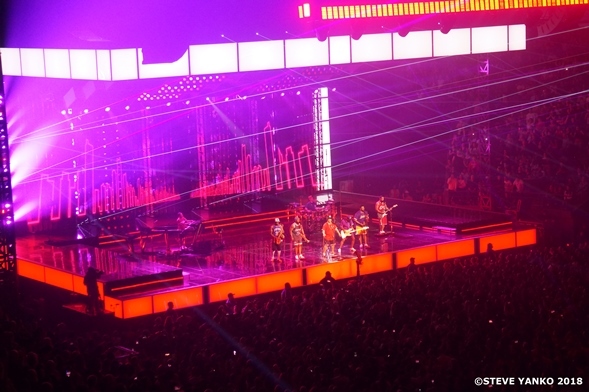 It got me thinking as to “how many people would go and see a Bruno Mars greatest hits tour?”…answer…millions!. 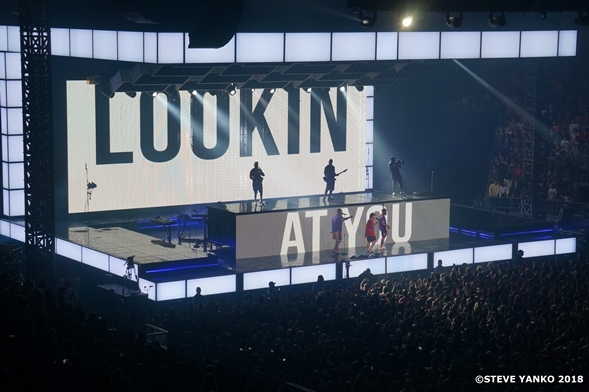 Bruno Mars & his band gave the audience in Melbourne a brilliant show. 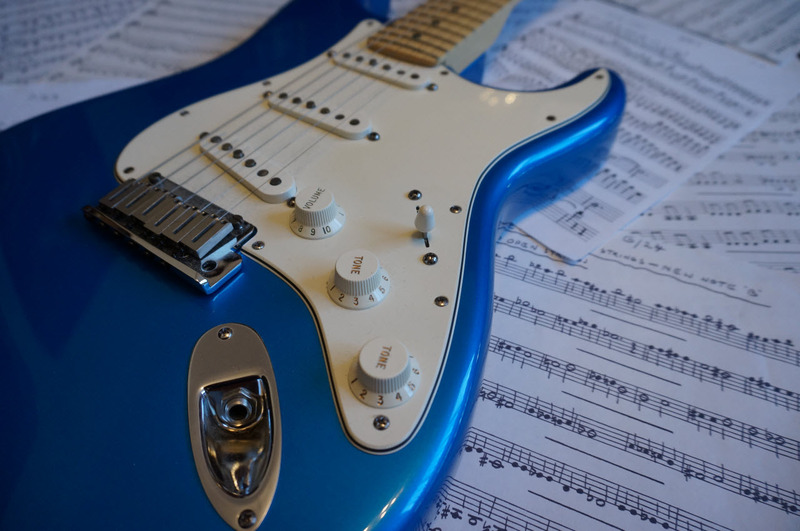 As I’ve said before, Bruno Mars is a superstar but more importantly he is in a position to inspire young people to learn a musical instrument, sing and to play real music. Last night’s show may have been one of many shows for Bruno Mars and his band but for the people who attended the show last night it was, dare I say, a magical night filled with brilliant music.